Find us by the Howgills at Cautley, on the right hand side of the A683 to Kirkby Stephen, about 2 miles out of Sedbergh, Cumbria. 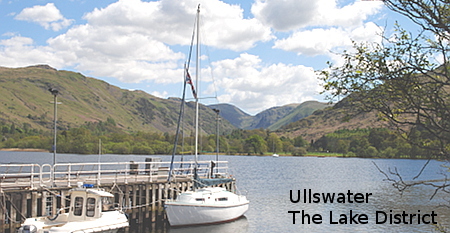 Convenient for both the Lake District, Cumbria and the Yorkshire Dales. 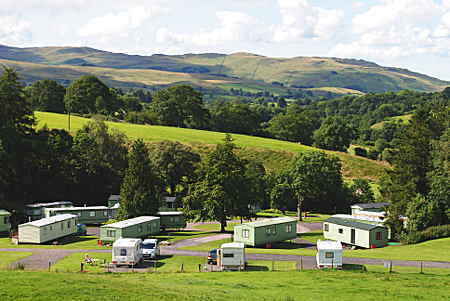 is a typical Cumbrian small working farm in the Howgills (the roadside view above is about a mile away) and our camping and caravan park is ideally located also for visits to a wide variety of areas in the Yorkshire Dales, North Lancashire and Morecambe Bay. Then there’s the Lake District and other parts of Cumbria such as the Furness Peninsula and the Eden Valley. See our “Local Area” page and our blog. is a small village, just a few houses and farms in the valley of the River Rawthey with the Howgills to the west and Baugh Fell to the east. Cautley Spout is the country’s longest cascade waterfall and a popular destination for local walks. are a group of beautiful rounded hills intersected by steep-sided valleys. Cross Hall Farm is at the foot of their eastern side, close to the River Rawthey. This is excellent walking country. The above panorama shows the Howgills as seen from the west near Lambrigg. is our local small town where supplies can be obtained. Click here for more on Sedbergh and the local area. Caravan and camping holidays are special. Where better to start a day than Cross Hall Farm Caravan Park? As we show on this page and elsewhere on the site we’re perfectly positioned between some of the most beautiful landscapes in the country. What better than a caravan on a quiet site or a camp fire meal outside your tent on a Summer’s evening looking across to the Howgills. We’ll look forward to welcoming you, and by the way we’ll also welcome a well-behaved dog.